By 1944, the evolution of armoured doctrine had produced very different outcomes in Britain and Germany. Offering a good balance of speed. protection and firepower, the British Cromwll tank could move much more quickly than its German opponent, but the Jagdpanzer IV tank destroyer had a high-velocity main gun and a lower profile that made it formidable on the defensive, especially in ambush situations. The two types would fight in a series of bloody encounters, from the initial days of the struggle for Normandy through to its climax as the Allies sought to trap their opponents in the Falaise Pocket. Using archive photos, specially commisioned artwork and battle reports, this facinating study assesses the realities of tactical armoured combat during the desperate battles after D-Day. This book is soft-cover of 80 pages in 7 1/4 " x 9 3/4" page format. The cover art shows a color illustration of a Cromwell moving across a grassy field with columns of back smoke in the distance behind it. It is overall green with a light colored rectangle with a black deers head on it at the left on the nose, over a yellow stenciled 51. There is a white serial no. T190031 in the center and a yellow circle with a black girbil rat on it on the left. The white serial no. is repeated on the turret sides over a yellow "Diana". At the bottom of the cover is a color illustration of a Jagdanzer IV, also on a grassy field. It is in a base of earth yellow with dark-green wave pattern. It is covered in zimmerit anti-magnetic mine paste and camouflaged with sections of brush. No markings are seen. The author, David R. Higgins is the author of several military history books, including 5 previous titles for Osprey's Duel series. He has also written nearly 50 article for magazines such as Strategy & Tactic, Armchair General, World of War and Modern War, and has appeared on television's "Greates Tank Battle". He lives in Columbus, Ohio. The illustrator for this book is Johnny Shumate. He works as a freelance illustrator living inj Nashville, Tennessee. He began his career in 1987 after graduating from Austin Peay State University. His greatest influences are Angus McBride, Don Treiani and Edouard Detaille. Johnny completed the battlescene, target views and cover illustrations for this book. Born in Malaya in 1949, Alan Gilliland studied photography/film and architecture, and spent 18 years as the graphics editor of the Daily Telegraph. He now writes, illustrates and publishes fiction as well as illustrating for a variety of publishers. Alan completed the three-way views, ammunition views and cutaway illustrations for this book. Sherman Firefly VS Tiger, Panzerjager VS KV-1, M10 Tank Destroyer VS Stug, III Assualt Gun, Jagpanther VS SU-100, Panzer IV VS Sherman and Peshing VS Tiger. 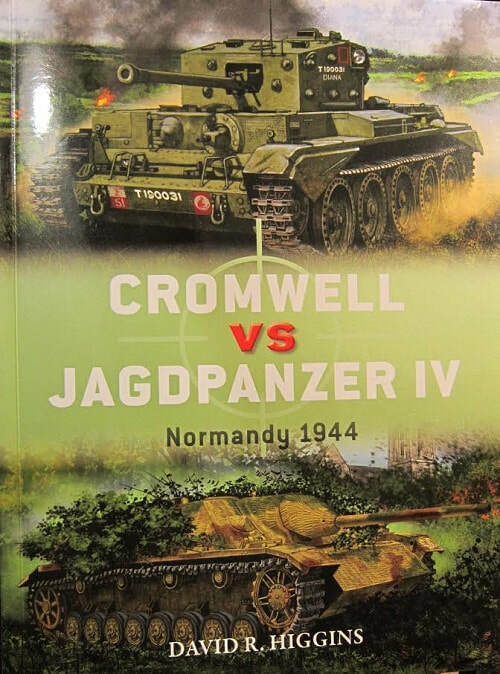 There is one color photograph in the book and 47 black and white ones, a color 3-view of both a Cromwell and a Jagdpanzer IV (L/48), a color illustration of both Cromwell and Jagdpanzer IV ammo, a color illustration of both the inside of the Cromwell and the Jagdpanzer IV turrets with a list of the names of parts in them, a list of the names of commanders of Cromwells and Jagdpanzer IV's, 3 color maps of Normandy D-Day action, a 2-page wide color illlustration of Cromwells moving across a field and 2 color illustrations looking through the telescopes of both the Cromwell and the Jagdpanzer IV. ​This book will be of great interest to both AFV enthusiasts and modelers alike. I want to thank the folks at Osprey for this review sample.